Two Bhutanese pastors charged with improper fundraising have been released from prison after serving reduced sentences and paying fines. Tandin Wangyal was released in January 2015 after paying a fine equivalent to about US $1,500. He had been sentenced to nearly four years in prison. Mon Thapa was released in September 2014 after paying a fine equivalent to US $1,630. He had originally been sentenced to 28 months. The men were arrested In March 2014 while they were carrying a sick child to a clinic in a village. They had arrived the previous day after an invitation to hold a three-day seminar for 30 Christians who came from neighboring towns. Additional charges against Wangyal were filed when prosecutors presented an computer hard drive that they claimed contained data indicating Wangyal had received funds from the public without official permission. Bhutan’s Home Minister Damcho Dorji told the Business Bhutan newspaper that religion played no part in the pastors’ arrest. Police said they found, after questioning the 30 Christians who took part in the three-day meeting, no evidence that the pastors had tried to force believers to convert to Christianity. The pastors were convicted of the remaining charges and sentenced in September 2014. Bhutan’s governing body that regulates religious organizations does not recognize Christianity as an official religion, alongside Buddhism and Hinduism. The Religious Organizations Act of Bhutan says registration of religious organizations protects the country’s Buddhist heritage. According to the CIA World Factbook, the country’s population is roughly 75 per cent Buddhist, 22 per cent Hindu. The remainder includes thousands of Christians. 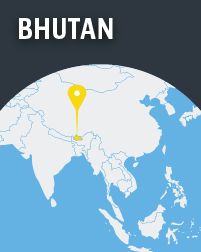 Bhutan is No. 31 in Open Doors’ World Watch List, an annual ranking of countries where life as a Christianity is most difficult. They endure threats and pressures from village heads and clerics to return to Buddhism. They can pray and worship privately in their homes, but they struggle to meet in congregations and to obtain official permission to do so.